From water storage systems in Antarctica and containment linings in Papua New Guinea to under house pillow water tanks in the suburbs and liners for aboveground tanks on farms and acreages across country Australia, Membranes Australia are the experts at dealing with all water storage, liquid containment and environmental protection needs. The company brings more than 30 years experience to the drawing board with our range of custom made liners and bladders. Beutyliner pillow tanks provide cost-effective concealed water storage under houses and decks. Beutyliner under slab and underground water and chemical storage tanks can be buried in an excavation and lawn planted over for an effective and eco-friendly enhancement to any garden. Or they can be installed under a building’s concrete slab during the construction stage. 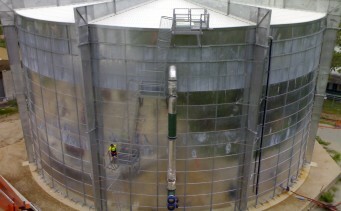 Membranes Australia also manufactures fitted lining elements for new and existing freestanding tanks, thus extending the life of leaking tanks and improving the construction times of new steel tanks. As all our liners are custom made, they can be made to fit any size tank – the largest free standing tank liner we have manufactured was installed in Townsville and measured 32 metres in diameter and 16 metres high. All our liners are approved for storage and collection of potable water and come with a 20-year guarantee when used for uncontaminated water.